Udupi is one of the treasured marvels when it comes to natural beauty. It is located in the premises of Karnataka state and is placed between the Western Ghats range and the majestic Arabian Sea. The cultural heritage of Udupi region woos the heart of every visitor. The name Udupi has been derived from the word Odipu. 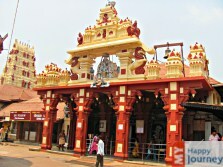 Udupi is famous by the name of Parashurama Srishti as well. Krishna temple situated here is known amongst pilgrims and travelers for the magnificent stone work that speaks about the talent prevailing in the past. Many pilgrims visit this temple in addition to numerous other temples located here to offer their prayers and seek the blessings from the almighty. Other temples with great religious significance here include Chandramoulishwar temple, Ananteshwar temple, etc. Kaup Beach is another hotspot here. One can enjoy peaceful walks in the serenity of the beach. In the close proximity of Udupi are located the renowned and mesmerizing beaches of Malpe, along with the holy Yellur Shri Vishweshwara temple. Adjacent to the famous Krishna Math is a Gurukul. The Gurukul is known for preaching the philosophical teachings of Dvaitam to the people interested in seeking knowledge about Vaishnavism. Udupi is famous for the traditional handicraft products like handmade toys for little kids or toy drums etc., and people can pick some of these for their kids. One can easily travel down to this amazing city via rail, road or airplane. The nearest airport is located at Mangalore city. All kinds of hotels are available in Udupi to make the stay of travelers pleasant.